We are so sorry your dog is missing. Our hearts go out to you and we hope you are reunited soon! We hope these tips will help you in your search. We do receive many requests to help locate missing pets; however, if our volunteers are unable to assist due to distance or ongoing street dog capture missions, there are many steps you can take to get started. In addition, you can utilize local pet detectives as well as the ideas listed below. Pet detectives normally use a scent-tracking dog to help locate your missing dog. As soon as you realize your pet is missing, the first thing we suggest is to get the word out about your missing dog and ask for help to search. 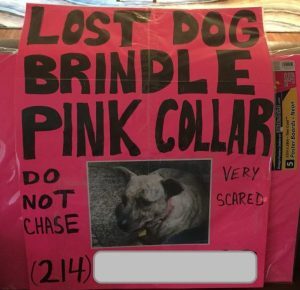 Post the missing dog’s photo, physical description, last known location, date/time dog went missing, and your contact info on social media, such as Facebook, Twitter, and Instagram. Immediately ask for volunteers to start searching the area where your dog was last seen. One of the most helpful tips we have is to NOT RELY SOLELY ON SOCIAL MEDIA to spread the word about your missing dog. We have had the most luck in obtaining sighting reports with old-fashioned CARDBOARD SIGNS. For examples of signs and tips on attaching them to poles, click here. File a Lost Dog Report on the Helping Lost Dogs website. This will automatically create a digital flyer that you can post online as well as a printable version that you can distribute and post at local businesses where you dog was last seen, such as coffee shops, convenience stores, vet clinics, pet stores, etc. Local animal shelters. Ask to file a missing dog report. Again, contact as many local shelters as possible, even if it’s not the city in which the dog was last seen. Dogs travel fast and can end up in another city quickly. Postal delivery workers (USPS, FedEx, UPS), police officers, pizza delivery drivers, etc. Telephone poles, at businesses, dog parks, etc. Windshields in parking lots near where your dog was last seen. Visit your local shelters often. Remember, dogs can travel a long distance in a short amount of time so visit your city shelter as well as the surrounding city shelters. Walk the “lost dog” kennels and post your lost dog flyer in their lobby. Ask the staff if there is a way to know about new dogs that enter the shelter in the event you are unable to visit every day. If your dog has a microchip, notify the microchip company and make sure your contact information is updated. In many cases, they can send out an alert. Create a classified ad in your local newspaper. Many times, lost dogs can develop evasiveness after even a short time on the streets. Their sense of smell can become diminished with stress, so it’s not uncommon for an owner to spot their lost dog, and call them or try to pick them up, only to have the dog run away. If you pinpoint the dog’s location but are unable to recover your dog, you should try to keep them in that area (see Establish a Regular Feeding Plan) so that they can be humanely trapped. Leave something with familiar scents by the feeding area; for example, one of your old t-shirts, dog’s blanket, etc. When the dog has been seen in the same general area, you can try trapping*. Trapping works best once you have the dog in a routine of eating at the same location/time of day. Only feed a little bit of dry, bland dog food the day before you’re going to try the trap. On the day of the trap, bring more smelly and desirable food such as hot dogs, rotisserie chicken or brisket. Make a small trail of food leading up to and into the trap and then place a “jackpot” of good food at the far end of the trap. When the dog goes in to eat, they step on a trigger plate which shuts the door behind them and they are contained. Transport the dog while still in the trap as you want to get them inside your home or garage before opening it up to minimize risk of the dog escaping. Do not leave the trap unattended for more than 30 minutes at a time. If you are not there to watch the trap, the dog may go in and someone else passing by might take her. There is also the possibility of another dog or animal going into the trap and injuring themselves trying to get out. If you are not sure if the dog is visiting your feeding station or what time it is coming into the area, you could borrow or purchase a wireless surveillance camera to set up and monitor the area. We hope these tips have been useful! If you would like more information or to talk to one of our Capture Team volunteers, please email us at capture@duckteam6.org.